LMS engine No.5596 was constructed at the Queen’s Park works of the North British Locomotive Co in Glasgow toward the end of 1934. As one of the 191 examples of the ‘Jubilee’ class, the engine entered traffic with the LMS railway in January 1935 and was allocated to Crewe. It was namedBahamas during its first service repair in June 1936. It subsequently operated from Preston, Camden, Willesden, Kentish Town and Derby prior to the outbreak of the Second World War. Indeed, its highest annual mileage was during 1939 when it achieved in excess of 72,000 miles during that year. During the war Bahamas worked from Grimesthorpe, Millhouses and Bristol. It was back at Crewe by 1947 and, as BR No.45596, would see operation from Edge Hill and Carlisle, before withdrawn from service at Stockport’s Edgeley shed in 1966. The engine was purchased in 1967 and sent to the Hunslet Engine Co. in Leeds for repair and a repaint into its former LMS livery. The engine, now operational, provided footplate rides for visitors to the Dinting Railway Centre. 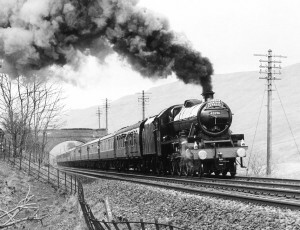 During 1972 it was chosen by BR to be amongst the first group of steam locomotives to work on designated routes over the national rail network, following a ‘Return to Steam’ campaign by locomotive owners. Boiler repairs became necessary during 1973 and Bahamas was taken out of service to become a static exhibit at the Society’s home at the Dinting Railway Centre. Work on the restoration of other locomotives by Society volunteers prevented a start on the overhaul of Bahamas until 1980. It was to be a further eight years before the overhaul was completed, at a cost of £16,000. All the work was undertaken by Society members, who effected a saving in the region of £50,000 when compared with the cost of similar work undertaken by contract firms at that time. Restored to its authentic British Railways condition, Bahamas successfully operated 37 railtours on the main line between 1989 and 1994, covering more than 12,000 miles before its main-line certificate became due for renewal. It was praised by both enthusiasts and professional railwaymen, and earned itself an enviable reputation for excellent reliability and good performance. Then followed visits to various heritage railways until the expiry of its boiler certificate in 1997 resulted in its withdrawal from operation. The engine then went on public display in the museum of the Keighley & Worth Valley Railway at Oxenhope, where it stayed until 2012 when it was invited to attend the ‘Railfest’ event at the National Railway Museum in York. Its stay at York was extended until the following year, when it returned to Ingrow. It was during 2012 that an application was made to the Heritage Lottery Fund to enable the overhaul of Bahamas to be undertaken by contractors and thus speed the process of its return to working order. The bid was successful, and by December 2013 work had commenced on the boiler, wheels and frames at the Tyseley Locomotive Works. See the Work in Progress page for updates with the project. What makes Bahamas historically significant is the double chimney. Although used on other classes of steam locomotives the double chimney exhaust arrangement fitted to Bahamas was the last experiment by British Railways to improve the performance of its fleet of steam locomotives. Although the concept and design of this arrangement for the ‘Jubilees’ had evolved at the Rugby Testing Station during 1956/57, it was not until May 1961 that Bahamas was fitted with the equipment during overhaul at Crewe works. Originally it was intended that five ‘Jubilees’ would have this modification in order to see how they performed under day-to-day service, for the test at Rugby had determined that the performance of the boiler to make steam was increased by some 30 per cent; a significant increase. However, Bahamas was the only example so fitted, and all experiments on steam locomotives were terminated the following year, thus precluding the opportunity of establishing any positive results. For a short video clip taken on the footplate of Bahamas, when on a North Wales Coast Express in the early 1990s, please view below.